Bill De Blasio universal Pre-K criticism: Research says that poor kids aren't benefiting as much from pre-k push. More NYC Kids Are in Pre-K Than Ever Before. But Are the Poorest Ones Being Left Out? Closing the achievement gap, starting as early as possible, has been at the centerpiece of New York City Mayor Bill de Blasio’s schools agenda. New York City Mayor Bill de Blasio ran on the promise to bring pre-kindergarten to every 4-year-old in the city, and in this, the second year of his mayoralty, he has made impressive strides toward delivering on that commitment, with 12,000 more kids registered for pre-K this year than last. 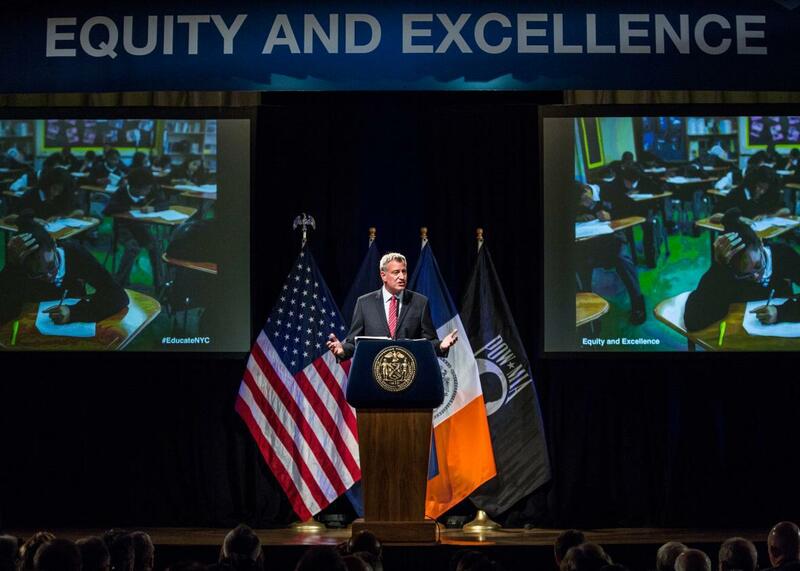 There are now a total of 65,000 4-year-olds enrolled citywide, compared with about 20,000 before de Blasio’s tenure. The article does point out that kids “in the lowest 20 percent of ZIP codes are still the most represented across the program,” making up roughly a third of all kids enrolled in universal pre-K. It’s that their ranks just aren’t growing as quickly as many expected or hoped, since bridging the achievement gap between poor and affluent children at an early age is one of the primary justifications for publicly funded universal early-childhood-education programs. But is this flatlining of lower-income registrations a real or a manufactured issue? This is a 2-year expansion, and the first year was heavily focused on low-income communities that benefit most from high quality pre-K. In the ten lowest-income communities, enrollment more than doubled last year. And that focus continued this year, where we pushed and successfully enrolled more than 1,000 children whose families were in homeless shelters. Professor Fuller’s bizarre allegation that low-income families aren’t served by this new system has been rejected by early education providers and experts over and over. There was no more detailed refutation of the numbers. When Fuller issued a similarly critical report last year—a time when the lowest fifth of ZIP code enrollment jumped by 138 percent—the same spokesman responded even more venomously, saying, “This study is based on errors and false assumptions that no New Yorker or early education expert would ever make.” The administration also pointed out that nearly two-thirds of its pre-K seats in 2014 went to neighborhoods with incomes below the city’s median of $50,000 for a family of four. It’s too soon to tell if the poor really are missing out on de Blasio’s bounty. But of course, pre-K, like any type of school, is most successful when it gets all kids—not just the ones who need it most—in the door, preferably the same door. That’s the real silver bullet.